The other night my husband happened across our unused ice lolly moulds in a box of barbecue stuff we hadn’t unpacked since we moved house, perfect timing as we’ve still got that heatwave and I’m in need of more quick recipes to help cool down. I knocked up a creation using some blueberries and coconut milk, made a mix and froze it in the moulds, it turned out to be the perfect thing to eat to cool down, albeit briefly! I posted a photo of it and my friend fancied the recipe to try it, so here it is Jen, give it a go and let me know what you think! You’ll need ice lolly moulds, mine were a random purchase from IKEA! You’ll also need a blender of some sort or you could smash the berries up in a mortar and pestle but the texture may be a bit chunkier. Pop a few fresh blueberries into each lolly mould, take the rest and add them to the blender, blitz until smooth. Give the mixture a taste and see if you want to add some agave to sweeten it a bit more, if you do add a spoonful and blitz again. Now you can either do as I did, or you can skip this step to make it even quicker. I took a third of the mixture and divided it equally between the moulds. Next add the coconut milk to the mix and blend, again tasting to see if you want to add some sweetener. Now fill your moulds up with the blueberry and coconut mixture. Pop the sticks in and freeze for at about four hours, then they’re good to go! I’m going to try out some different flavours, I’m thinking coffee ones next, any ideas please let me know! It’s bank holiday weekend in the UK this weekend and fingers crossed it looks set to be a rain free one for most! With the prospect of good weather and a three day weekend ahead, I decided to make something summery to drink, iced tea. I love iced tea and have been making different versions of it for years. This time I’ve made a really simple recipe. This is mostly because my kitchen cupboards and the fridge are looking rather bare, we’re due a trip to the market to stock up this weekend. So, craving iced tea I searched around the kitchen for something to jazz it up. Lurking at the back of a cupboard was a rather sorry looking little tin. Tinned peaches in juice. Now I’m not a lover of these at all usually, and they have been sat in the cupboard for months, a leftover from when my sister stayed with us, she loves them, as does my mum. I do love peach iced tea though… you can see where this is going! You’ll need a jug or teapot that holds a litre of water to steep the tea in. Put the litre of water in the kettle to boil. Add the teabags to the jug, once the kettle has boiled leave it for a few minutes so as not to scold the tea. After a few minutes, pour the water over the tea as if you’re making a giant cup of tea. Strain the juice from the peaches into the tea too and stir. Leave for a few minutes to brew and remove the teabags. Give it a taste, if you want to sweeten it, then do that now. Next you want to leave it to cool, it is ICED tea after all! Pop it in the fridge to get really cold. Put the peaches in the fridge too, you can use these to serve in the glass with your tea. That’s it, when it’s chilled serve it with ice and the peach slices. You can add slices of lemon or mint too. You could even try adding a shot of rum or bourbon if you like. Also thanks to my sister for leaving behind a tin of peaches! I’m not sure when I first discovered I had a serious love for mac and cheese. It was definitely as a child and it was either at home with a Heinz tin of it, on toast naturally, every tinned pasta in the UK ends up on toast, or on a trip to America as part of an all you can eat buffet. On reflection, it wasn’t the best mac and cheese in the world but it started something. That bright yellow, that isn’t found in any other pasta dish I can think of, just draws me in! I make a pretty good regular mac and cheese if I do say so myself, but I’m eating less and less dairy lately so have made a vegan version of mac and cheese a few times now. I made it the other night, under the watchful eye of my Madre, and whilst I asked her to taste the sauce, I remembered she doesn’t like mac and cheese… On tasting the sauce, her words were something along the lines of, “oh that’s good, you wouldn’t know if didn’t have dairy in”… success! I’m not sure I agree with her that you wouldn’t know, and maybe she was just being nice but it did taste pretty good. It didn’t taste like the real thing, it never will do, but it’s fast becoming a good replacement. OK, before the recipe, I feel I need to explain first what nutritional yeast is for those that don’t know. Why do so many vegan essential ingredients have hideous names? So, it looks like fish food, stay with me, it’s got a nutty, creamy, cheesy flavour, so works great in sauces like this to add a savoury cheesy taste to it. You might hear it called “nooch”, I’m not cool enough for that, so seek out some nutritional yeast and give it a taste! 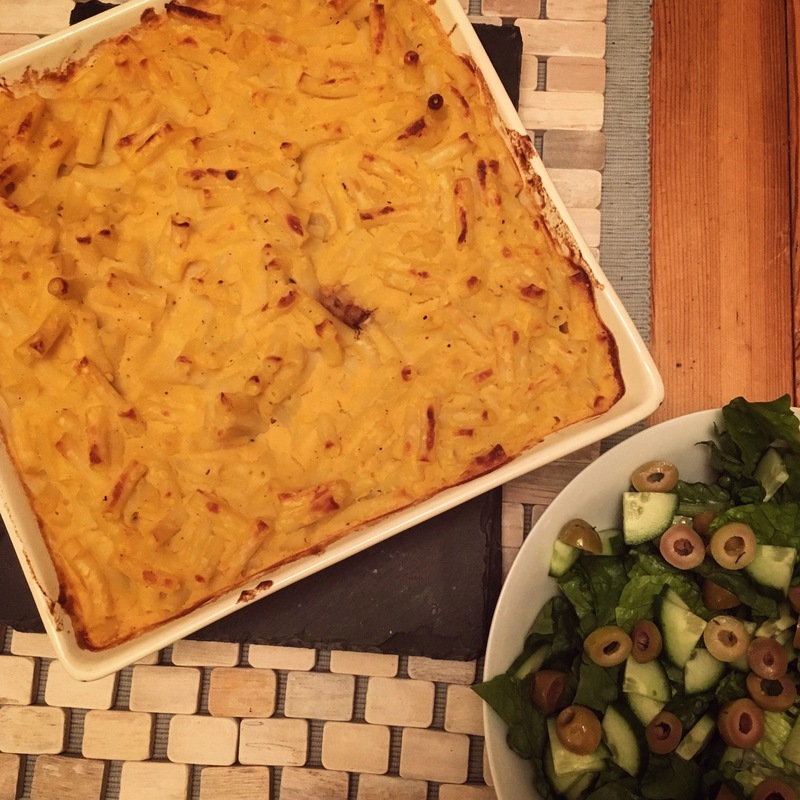 Anyway, on with the recipe… It’s a good base for a vegan mac and cheese recipe but as usual with most of my recipes, I always meddle and tweak it each time I make it. This served 4 very hungry people, would probably serve more though! You’ll need some sort of a blender for the sauce. Start by getting a pan of boiling water on for your pasta and put the kettle on to make your stock with. While this is happening prep your veg. In a big frying pan heat some oil and fry the onions over a medium heat. When they’ve softened add the garlic, squash and potato. Let these fry for a few minutes. Add the stock and the milk, you can add more liquid later if you need it. Add the mustard and leave to simmer until the veg are soft. Put the pasta on to cook, follow the instructions on the packet for this. Once the veg are cooked through, blend the sauce and add the noo… nope, can’t say it, sounds stupid… nutritional yeast and keep blending until it’s smooth. You might want to add some more liquid here if you need it. Give it a taste and season the sauce to your liking. Now the next step depends on how patient and hungry you’re feeling. Mix the sauce with the cooked pasta and pop in a dish under the grill to make the top a little crispy, or just eat it as it is if you can’t wait. I sometimes like to add herbs and breadcrumbs to the top before I grill it too, experiment with it! Carrot salad might sound boring, stay with me, it’s not! Turning various veg into noodles and spaghetti is quite commonplace now and this salad kind of plays on that. Don’t worry, no fancy spiralising gadget needed! Unless you have one, which I do as I’m a sucker for a gadget sometimes, then by all means use it, but all you really need is a speed peeler to turn your carrots into ribbons and make an interesting salad. I’ve said it countless times, salads really aren’t boring and don’t have to just be a sad pile of lettuce with a few token slices of tomato or cucumber. Get creative with them and your lunch break will be better for it! This salad is great by itself, or as I had it for lunch today, on a load of different salad leaves. It’d be great as a side dish to a curry for something fresh and crunchy, or in wraps with falafel, there’s loads of ways you could try it. It makes enough for about 2 to 4 portions depending on how you’re serving it. 1 red chilli, as usual, take the seeds out if you don’t like it hot! Use the speed peeler to make ribbons of carrot, tear the coriander leaves (use the stalks for another recipe), finely slice the other veg. That’s pretty much it! Pop it all in a bowl and toss it with some oil, lemon juice and salt. It’s a great base for a salad and you can add new things to it to make it different every time. Don’t have any celery, or don’t like it, just switch it out for something else like cucumber or peppers. Use different seeds and herbs. It’s really easy and versatile. Another reason to never have a boring salad again!